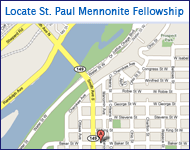 St. Paul Mennonite Fellowship (SPMF) welcomes you! We are a small, lay-led congregation that takes seriously the "priesthood of all believers" (I Peter 2:5-9). That means we regard ourselves as pastors to one another, sharing in a common ministry. We want you to feel comfortable joining us in worship and asking any of us questions about SPMF. More than that, we want you to know that we welcome your unique ministry among us! SPMF meets weekly in the church building owned by Cherokee Park United Church. Our worship style is collaborative, informal and participatory. Joining us for a worship service is a great way to meet and get to know our congregation. Below you will find details about our monthly worship times and location. We are a progressive and inclusive congregation that values the peace and justice witness of the Anabaptists. We claim the history and tradition of Mennonite Church USA, with whom we are affiliated via the Central District Conference. SPMF is a publicly affirming member of the Supportive Communities Network - a network of congregations and communities within the Mennonite and Church of the Brethren denominations that welcome lesbian, gay, bisexual and transgender people and their many gifts. In this respect, we dissent from the official position of the Mennonite Church USA. We invite you to get know us in person by visiting us. We also invite you to explore our community on this site. To better understand our beliefs as a community, please visit our Common Ground page. For more information about our worship, please see "Worship Details" below. Our community page provides information about how we work and play together and how we support each other and our children outside of Sunday services. Our history page chronicles our evolution as a community over the past 25+ years. Finally, for information and resources about the organizations/institutions we support or with which we are affiliated, visit our links and resources page. We meet together for worship on the second, third, fourth, and fifth Sundays of each month. Typically, the worship for each month is centered around a consistent theme. Each Sunday, worship is coordinated by one of our members. On the first Sunday of the month, we meet for business and a potluck supper. Joining us for this supper is also a great way to get to know us. Don't worry about bringing food — there's always plenty! We worship Sunday afternoons at 4:00 p.m. in the Fireside Room of Cherokee Park United Church of Christ at 371 West Baker Street in St. Paul's West Side neighborhood. [View map»] Note that we meet for business and a potluck meal on the first Sunday of most months. Leaving a message on our Facebook page is the best way to get a timely response, as neither our voice mail nor our e-mail is checked with any regularity.